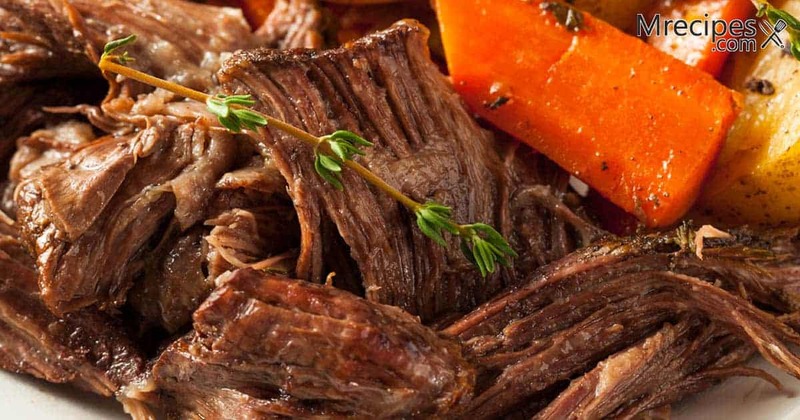 I have very fond memories of a chuck roast that my mother would make mid-week to feed a crowd. The recipe included submerging the roast in a thick mixture of mushroom soup and dried onion soup mix with a bit of wine or broth and placing it in the oven mid-afternoon. It roasted low and slow for hours. By the time we got home from school the house smelled divine and we couldn’t wait for dinner. I think it was a trick to get us to be excited about something mid-week. The meat was so tender you didn’t need a knife to cut it. Beef chuck is a cut from the muscular shoulder of the steer. It is marbled with some sinewy fat. When I say sinewy, I mean that it is not the melting fat you might find in Wagyu beef that is fed beer, massaged, and listens to classical music. It is a little stringy because these animals roam and aren’t pampered. Cooking this cut slowly causes the muscle and fat to relax, for lack of a better description. You can buy chuck as a slab that looks like London broil or brisket. Or, you can buy the blade cut that includes the shoulder bone. The bone adds flavor, but I am partial to the boneless for smoking. It makes for easy slicing or shredding and serving. This is a reasonably priced cut of beef that is perfect for smoking in a Masterbuilt Electric Smoker. The recipe outlined here uses a dry rub to season the meat. It also calls for 2 cooking techniques in the smoker to make sure the roast remains as moist as possible. Mesquite wood is nice with this recipe. You can use any wood chips you prefer. This is pretty much an all day smoking process. I like to serve pot roast with smoked green beans and macaroni and cheese. It is also excellent the next day when shredded and served on a toasted bun with creamy, crunchy coleslaw. 1. Give your roast a quick rinse under cool running water. Pat it completely dry with paper towels. Trim the roast of any excess surface fat and silver skin. Set it aside while you prepare the rub. 2. In a large baking dish, combine all of the dry rub ingredients. Using your hands with a pair of gloves works well. Add the roast to the dish and coat all sides with the rub, patting it on to adhere well. Set the roast aside while you tend to your smoker. 3. Remove the middle or lower rack of your smoker. Prepare the smoker by adding wood chips to the tray and water + 1/4 cup of beer to the bowl. Preheat the smoker to between 225°F and 250°F. Open the top vent. 4. When the smoker is up to temperature, place the beef on the rack and put that into the smoker. Smoke the roast for approximately 5 to 6 hours, or until the internal temperature reaches between 160°F and 175°F. Figure on 1 hour per pound. Replenish the wood chips and water/beer mixture every 45 to 60 minutes. Lack of smoke from the vent will let you know when to replenish. 5. When you have reached the desired temperature, place 2 large sheets of the foil on a cutting board. Place the roast in the foil and cover, sealing the seams tightly. Place the sealed roast, seam side up, back in the smoker. Smoke for approximately 1 more hour until the internal temperature reaches 190°F. 6. Remove the roast to your cutting board and allow it to sit in the foil for at least 30 minutes and up to 1 hour for the juices to reabsorb into the meat as it cools. It is highly recommended that you have a cutting board that has a grooved well around the perimeter to catch any juices when you open the package. These are excellent for pouring back over the meat after it has been sliced or shredded. 7. Open the foil and place the chuck roast on your cutting board. Discard the foil. Slice the roast with a very sharp blade, unless you are shredding for sandwiches. Serve with your favorite sides, as suggested below. 1. Wash and trim the beans. Soak them in a clean sink or bowl filled with water for 1 to 2 hours. 2. Line a sheet pan with foil or use a disposable foil pan. Place the beans in the pan in a single layer and lightly coat with the dressing. 3. Place the beans on the upper shelf of the smoker when you put the roast back in for the final hour of smoking. Cook for approximately 1 hour. 4. Remove from the heat and squeeze lemon juice over the beans. Close the foil around the hot beans, or cover the pan with foil. Allow them to rest for 15 minutes before serving. As mentioned above, another great side dish for smoked chuck roast it smoked macaroni and cheese. Like the beans, place the mac & cheese above the roast. This can go into the smoker the same time the green beans go in. You have all day, so make the best of it by preparing yummy smoked side dishes. While you are at it, make a batch of coleslaw for leftover pulled beef sandwiches for the next day. I enjoy a very simple and creamy classic cabbage slaw. It is always best made a day ahead of time. Pile it on top of the shredded or pulled beef on a soft roll. Serve with chips and pickles on the side. This is an effortless and rewarding lunch for the next day after having spent the day before prepping and smoking. Sounds great for tomorrow’s Super Bowl LIII. Love my Masterbuilt and will use 🍒 wood to smoke along with this chuck roast recipe.